Age 96 of Manhattan, passed away peacefully Saturday, October 27, 2018 at her home. Born March 24, 1922 in Joliet, Illinois, Loretta Catherine was a daughter of Clarence Decatur and Catherine Elizabeth (McGovern) Green. 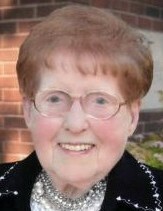 She attended St. Patrick Catholic School in Joliet; graduated from Joliet Township High School with the Class of 1939 and went on to earn her teaching certificate from Joliet Junior College. Loretta later went on to attain her Bachelor’s Degree from Pestalozzi-Froebel Teachers College in Chicago and her Master’s Degree from Governor's State University. On December 26, 1942, Loretta married Francis T. “Jiggs” Long in St. Raymond’s in Joliet, and together they raised their family and made their home in Florence Township. Loretta’s career in education began at Union School for one year before taking a position at Symerton School where she taught for the following 5 years. Loretta is most remembered however for her 30 years in Manhattan, where she taught and also served as Principal at Anna McDonald School. Loretta was an active member of St. Patrick Catholic Church in Wilton Center where she was a religious education instructor, and served as a lector and cantor. She was a member of the Illinois Retired Teachers Association, and continued to enjoy getting together with her fellow friends and retired teachers. An avid and die-hard Chicago Cubs fan, Loretta also enjoyed playing cards, working puzzles, both word and jigsaw, baking and cooking. Family was of the utmost importance to her, and Loretta’s children, grandchildren and great grandchildren were her greatest hobby, and brought her the most joy. Survivors include her two daughters: Cathy (Paul) Engler of Manhattan and Loretta Robbins of Wilmington; six grandchildren: Mike (Jennifer) Robbins of Morris, Steve (Janet) Robbins of Wilmington, Sue (Tom) Carroll of Barrington, Tom (Dawn) Engler of Manteno, Mark (Michelle) Robbins of Woodridge, and Jean Langel of Knox, Indiana; (21) great grandchildren: Jordan, Claire and Nolan Robbins, Steven, Holly, Noelle and Patrick Robbins, Colleen and Kate Carroll, Delaney (Charles) Kilgore, Payge Wragg and Kerrigan, Madison, Conner, Matthew, Jenna and Ryleigh Engler, Luke, Lily and Lexi Robbins, and Madeline Langel; numerous nieces and nephews, and her special caregiver, Cindy Myers. Loretta was preceded in death by her parents, Clarence and Catherine Green; husband Francis “Jiggs” Long (May 31, 1991), her son-in-law, Jerry Robbins (October 11, 2017) and one sister, Alice (Laverne) Lovell. The family will receive friends for a visitation on Thursday, November 1, 2018 between the hours of 3:00 p.m. and 8:00 p.m. at Baskerville Funeral Home, 700 East Kahler Road in Wilmington. Funeral services will follow Friday morning, November 2, 2018 – meeting at St. Patrick Catholic Church, 14936 West Wilmington-Peotone Road in Wilton Center for a 10:00 a.m. funeral. A Mass of Christian Burial will be con-celebrated with Reverend Dan Hoehn and Reverend Sebastian Gargol presiding. Burial will be in Mount Olivet Catholic Cemetery in Wilmington, where Loretta will be laid to rest with her late husband. Preferred memorials in lieu of flowers may be made as gifts in Loretta’s memory to Kuzma Care Cottage, 635 S. Main Street, Wilmington, IL 60481 or to Joliet Area Community Hospice, 250 Water Stone Circle, Joliet, Illinois 60431.